I’m so excited to announce that I am the recipient of the 2019 Business of Art Scholarship! I will get to exhibit at the Mission Federal ArtWalk in Little Italy on April 27-28, receive a marketing package from San Diego Visual Arts Network, and be mentored by @thestudiodoor. Come see me at Booth 621! More info here on the event. SAN DIEGO, California - March 25, 2019 - Mission Federal ArtWalk, San Diego Visual Arts Network and The Studio Door are pleased to introduce the artistry of emerging artist Molly Paulick at the 35th Annual Mission Federal ArtWalk in Little Italy to held on April 27 and 28, 2019. Molly was selected as this year’s The Business of Art scholar and will be featured in tent 621. 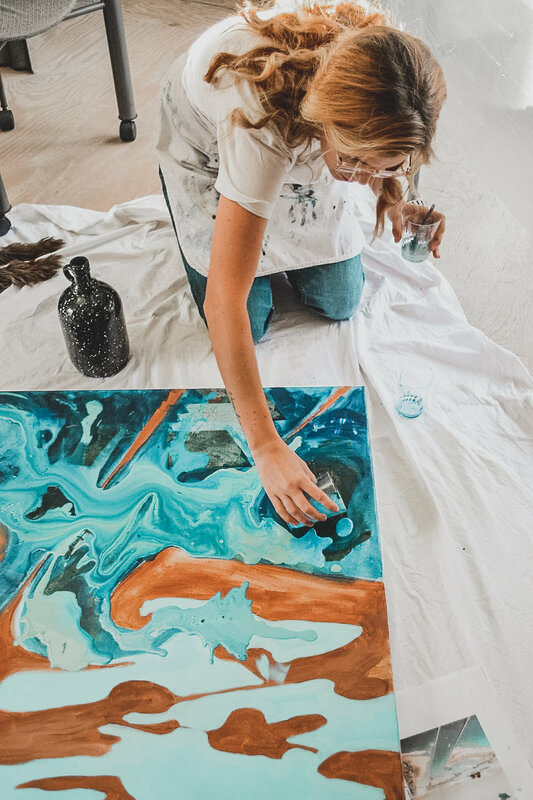 The Business of Art Scholarship is awarded to one lucky art student or emerging artist who has a well developed body of work to showcase and is interested in selling their artwork. The scholarship includes a booth at the prestigious art festival, professional development throughout 2019, and an impressive marketing package. Over 30 artists applied for this year’s opportunity. Molly was born in Irvine and currently resides in San Diego. She graduated from Azusa Pacific University with a B.A. in Studio Art. Her paintings combine dueling perspectives of aerial viewed landscapes and local plant life. By engaging in both the natural and man-made beauty that surrounds her, she explores the healing power of paying attention in a world full of distraction. View her work online at her website [mollypaulick.com]. "Receiving this scholarship is a dream come true and has provided me quite the stepping stone to launch my professional career as an artist in San Diego. The encouragement, support, and business advice that I've already received has proven to be invaluable in getting me ready for the ArtWalk. I’m incredibly grateful for this opportunity, and I can only imagine where it will take me in the future," said Molly. San Diego Visual Arts Network (SDVAN) will provide Molly with a marketing package that includes a presence on their website [sdvisualarts.net]. SDVAN provides a resource rich database of opportunities and events taking place in the region. The site’s most popular features includes RAW, an arts gossip column, and Picked RAW Peeled, an in depth exploration of the latest exhibitions and events. Stillman runs the galleries and artist studios at The Studio Door [thestudiodoor.com], which offers opportunities for artists to engage in professional development and art patrons to explore diverse artworks. In April, The Studio Door will feature the works of Eleanor Greer who was last year's scholar alongside of other Southern California artists. For details on Mission Federal Artwalk, please visit artwalksandiego.org and save the dates of April 27 and 28, 2019.